I was really excited for two reasons; 1. 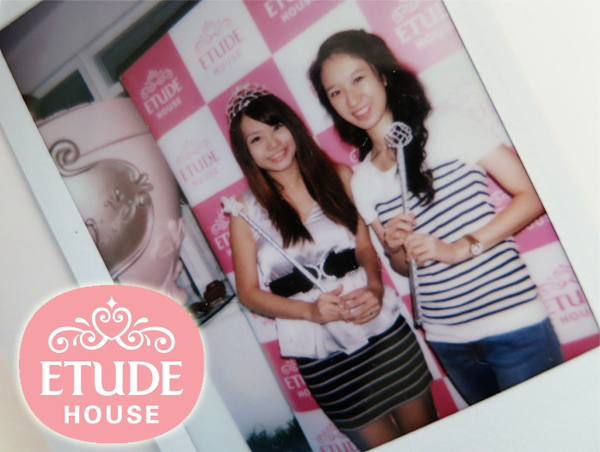 I think it was the first ever Etude House event in Singapore. 2. Have you seen the über gorgeous Princess Etoinette Collection?!? It's ballet pink, completely sweet and so, so, SO pretty!!! Here are the main pieces of the rather massive collection! Look at the gorgeous brushes, the gorgeous pots of highlighters and blushers, the gorgeous nail polishes... Gorgeous everything!!! 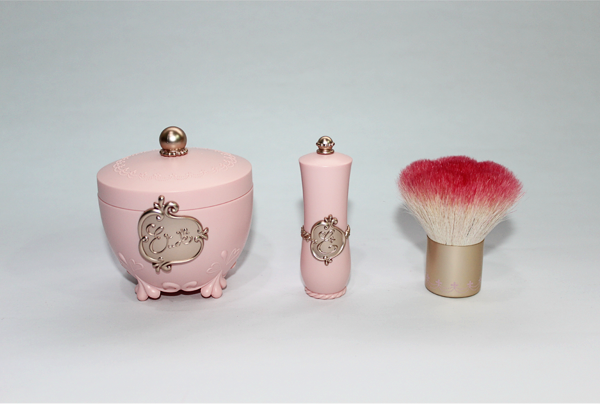 The Princess Etoinette Collection is deemed as a makeup line for real princesses! It conjures an image of princesses in Versailles, who know truly what it means to be a princess and embody it. They are beautiful both on the inside and outside, are confident and loving. This collection was designed by the famous cosmetic bottle designer Sylvie de France. She was inspired by European royal treasure in palaces and designed the collection as an interpretation of a modern princess. 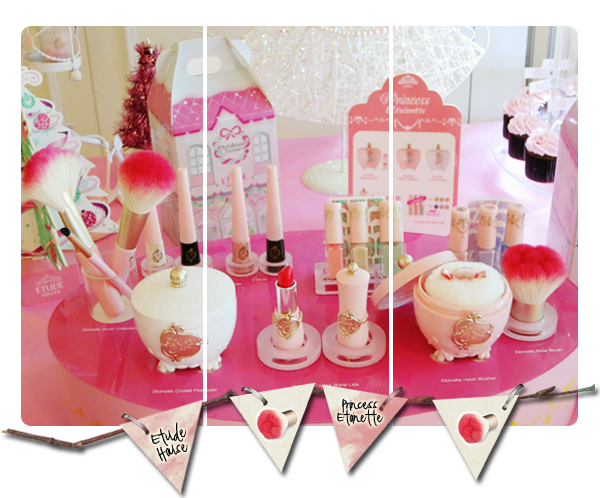 This collection is in line with Etude House's goal of turning us all into princesses. 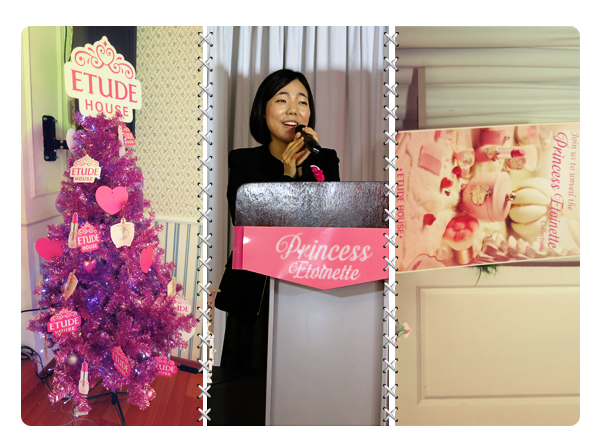 And this is just the first theme, (Princess Etoinette's Private Treasures) for the year! Okay, I love practically every item from this collection but if you were to ask me to pick just one item, it would have to be the Etoinette Heart Blusher (The Etoinette Rose Brush comes very close.). This darling blusher in PK001 Pink Petal Kiss is a sum of 10 hearts, of 3 shades of shimmery pink (There are two more sets. 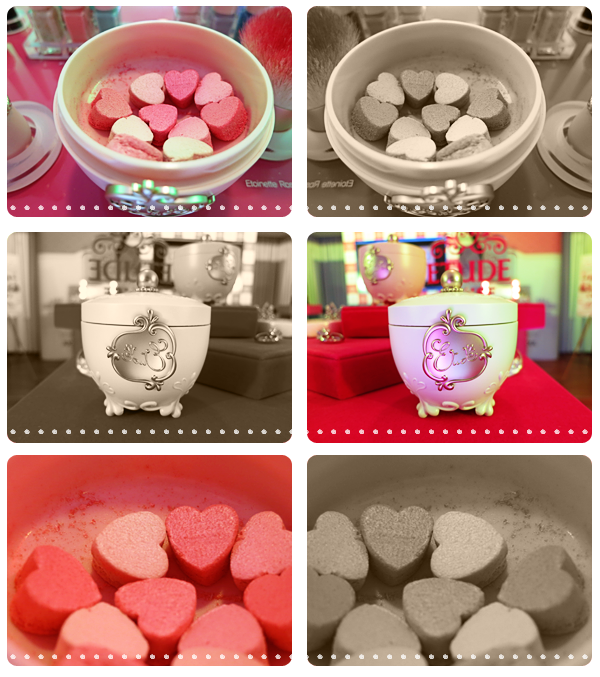 One which consists of orange hearts in OR201 Coral Masquerade, for the warmer skin tones. The other has white hearts and is a highlighter. ). 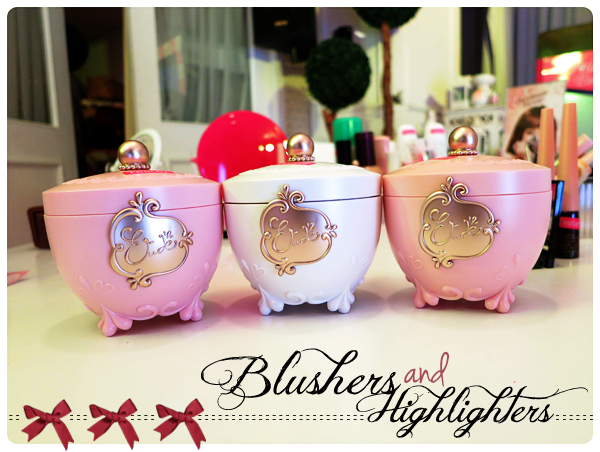 You place them in the gorgeous tub, swirl your Etoinette Rose Brush and you have cheeks that have been kissed by an angel! The white tub is the Etoinette Crystal Powder. The puff for this is covered with lace! 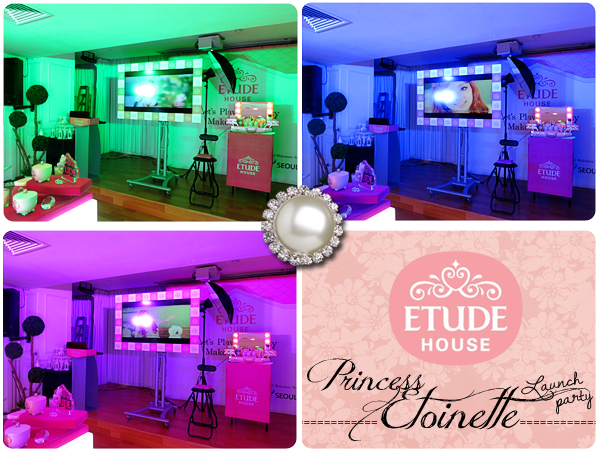 Etude House sure knows how to make a girl feel royal! The Etoinette Crystal Powder is a pearl-infused loose powder. It consists of white, red and orange fine pearl highlights. With a soft texture and moisturizing ingredients, this helps to absorb excess sebum without clogging pores and adhere to your skin comfortably for a soft, glowing effect. I'm sure my heart's in one of those pots! This collection has 8 new lip colours but the main ones are #POR202 Dazzling Sunlight Date (Right.) and #PPK001 Midnight Masquerade (Left.). 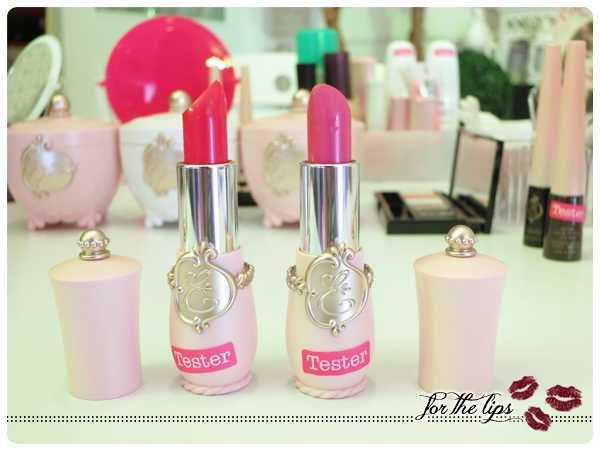 These lipsticks are formulated with MuruMuru Butter, French Royal Jelly and fruit extracts (Plum, Apricot and Peach.) so that you have soft, moist and princess-worthy lips! 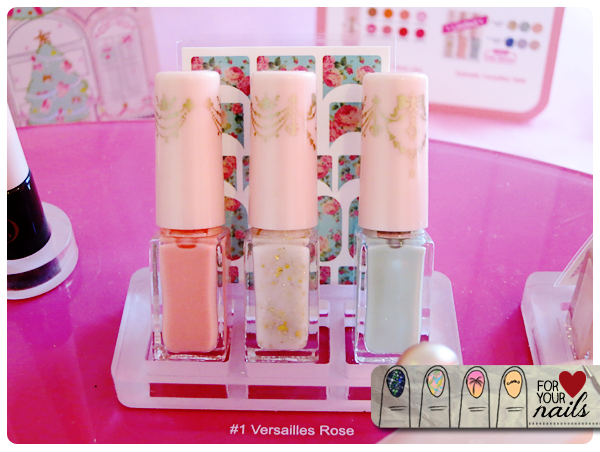 My love for pastels have not faded so I'm definitely getting the Etoinette Versailles Nails in #1 Versailles Rose when I pop by Etude House in Taiwan! Just look at the pretty stickers!!! 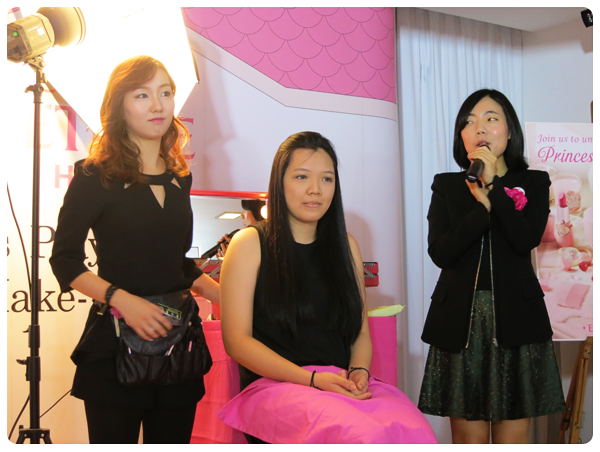 This was followed by a makeup demonstration by one of Etude House's makeup artist. She was really pretty and had picture-perfect, flawless skin! Her makeup was immaculate too! She used items from both the Princess Etoinette Collection and the Christmas Miracle Collection. 2. To contour, draw an inverted E downwards on the 2 sides of your face. Remember to connect your neck and your ear lobes and don't go into the highlighted areas. 3. The blusher should not go below the nose line. Focus on your apples to create the doll-like look. 4. 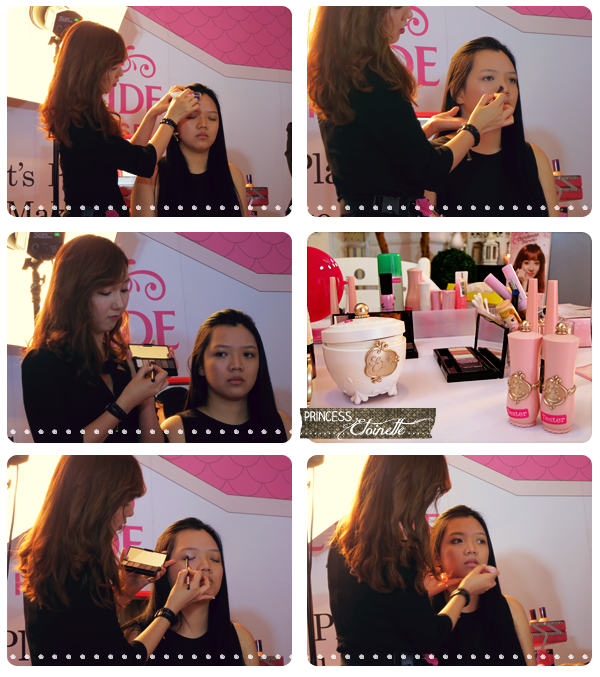 For luscious lips, apply the lip gloss only on the centre of your lips. 5. Set your makeup with a facial mist. 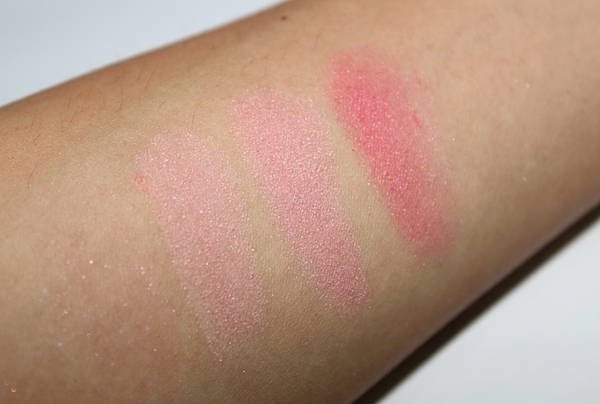 As aforementioned, the Etoinette Heart Blusher comes in 3 shades; PK001 Pink Petal Kiss for the fair-skinned, OR201 Coral Masquerade for the warm-skinned and the Etoinette Heart Highlighter. 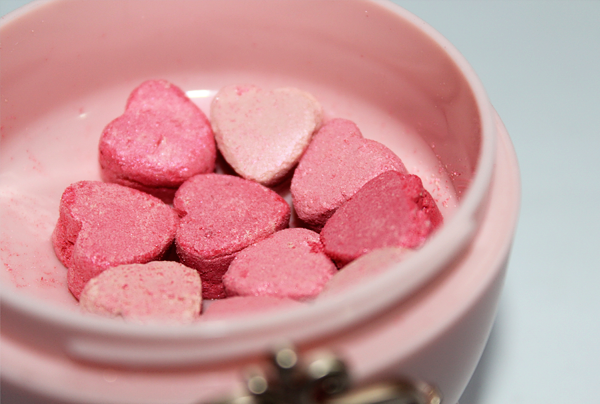 Housed in a 12g pot, each contains 10 shimmery hearts of 3 different intensities. 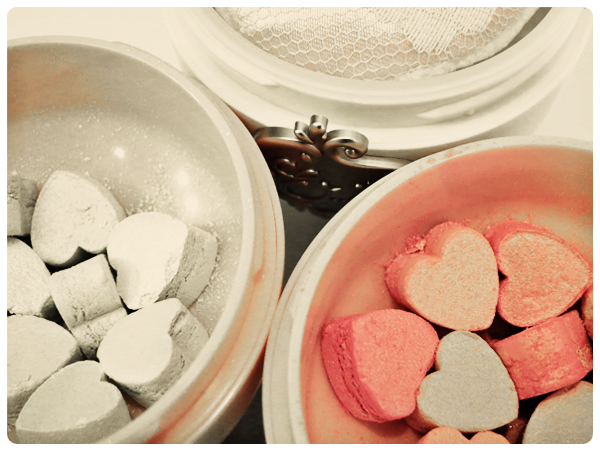 The baked heart-shaped powder cakes are combinations of pearl-infused, vibrant and translucent shades. These go on smoothly with a silky texture. They are long lasting and add the prettiest dimensions to your face. 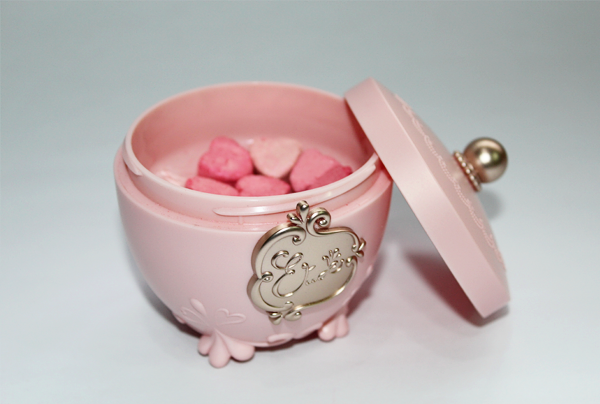 To apply, just swirl the Etoinette Rose Brush in the pot and swipe it across the apples of your cheeks. If you need more powder, shake the pot a little. Etoinette Crystal Shine Lips in #PPK001 Midnight Masquerade is one of 8 shades and is a half of the main duo. It provides a long lasting colour with just one application! 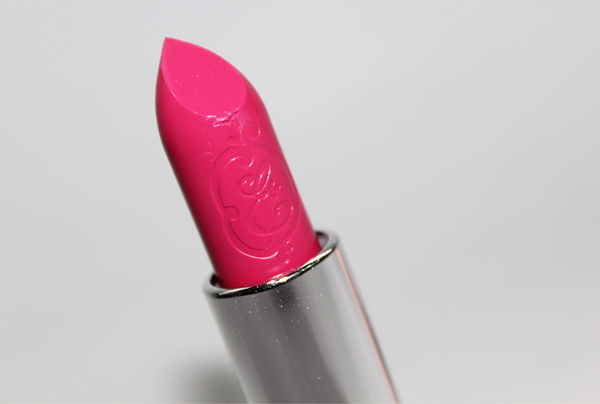 The Etude House's E is embossed on the lipstick body! #PPK001 Midnight Masquerade is a lovely shade of berry pink. 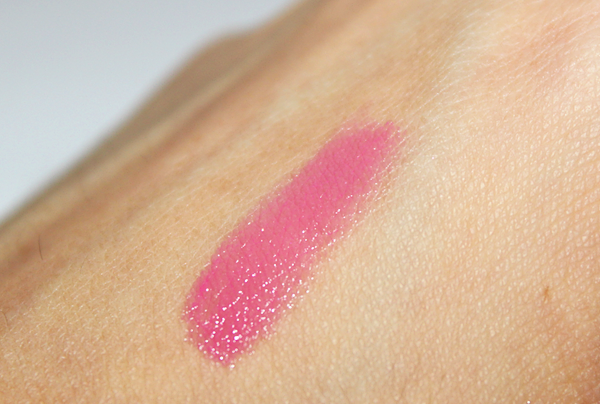 It adds a light wash of colour to your lips and is very moisturizing. 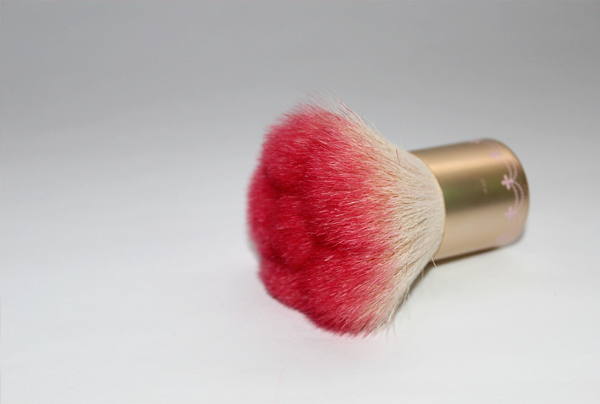 Last but not least, the Etoinette Rose Brush! This brush is cut at 5 different lengths to create the blooming rose design, providing contoured and detailed coverage. It is made from high quality natural goat hair and is perfect for blushers, highlighters, loose powder and pressed powder makeup. P.S. :I was at the Wisma outlet yesterday and there were so many girls and ladies in there, checking out the collection (Especially the brushes!). I don't think I have seen Etude House this crowded before and there was this lady who came out of the shop with 3 huge bags of Etude House products! This collection is really the prettiest! I want that nail set as well!!!! it's absolutely gorgeous! Yes, it is! :DDD The accompanying stickers are really pretty too!